Where have you seen MATH today? An on-going extra credit opportunity: Take a picture of somewhere you see mathematics referenced in real life and e-mail it to me. I'll post pics and their contributors here as well as on the board in our classroom, and you'll receive extra-credit that counts towards your homework points! True or False? 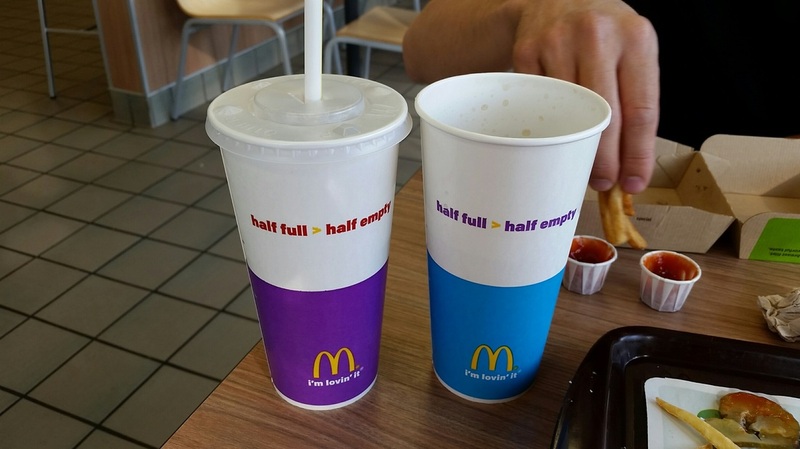 Can you find the *possible* mathematical mistake in these cups I received at McDonald's? This website is designed to keep students and parents up-to-date with classes, assignments, and other news. Lesson plans are posted (subject to change) and should be used to prepare yourself for class and/or catch up after an absence. Lesson plans are found on the individual webpage for each class. They are subject to change, depending on how fast/slow the class may move during the week. They will be updated or changed as necessary. The best online graphing calculator simulator that I have found is at www.desmos.com. Take advantage of this when at home if you need a graphing calculator and did not remember to check one out at school. There is also a free Desmos app that can be downloaded to your mobile device. Click on the following button to follow the link; once you are at the webpage, click on the large red button that says "Launch Calculator". There is an app free for Android operating systems called Wabbitemu that is a perfect simulator for TI calculators. It can be found in the google play store. At this time, I have not found a free one for iOS; however I believe that it is only a few dollars to download.